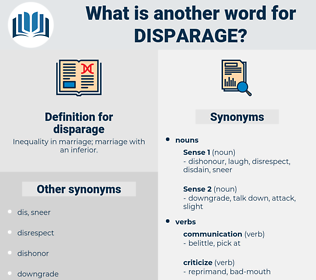 What is another word for disparage? Inequality in marriage; marriage with an inferior. esteem, honor, sanction, laud, compliment, inspirit, raise, exaggerate, approve, overrate, admire, respect, praise, hearten, encourage, commend, overestimate, maximize, exalt, increase. eulogy, sustain, shield, acclaim, endorse, vindicate, countenance, applause, benefit, panegyric, cheering, approbation, protect, flattery, conserve, sycophancy, Laudation, plaudit, favor, glorify, eulogize, uphold, blandish, recommend, encomium, tend, approval, extol, cherish, acclamation, consider, regard, Panegyrize, cheers, care for, adulation. Between the two men, indeed, there was very little political sympathy, and Canning had got it into his mind, rightly or wrongly, that the Duke of Wellington had done his best to disparage him and to weaken his authority as Foreign Minister. He reminded me of Florence, which I didn't pretend to forget; but it was rather awkward, for I remember I used to disparage that woman to him. dispraise, disk brake, diospyros, disperse, Diospyros Kaki, disburse, disc brake, dysphoric. 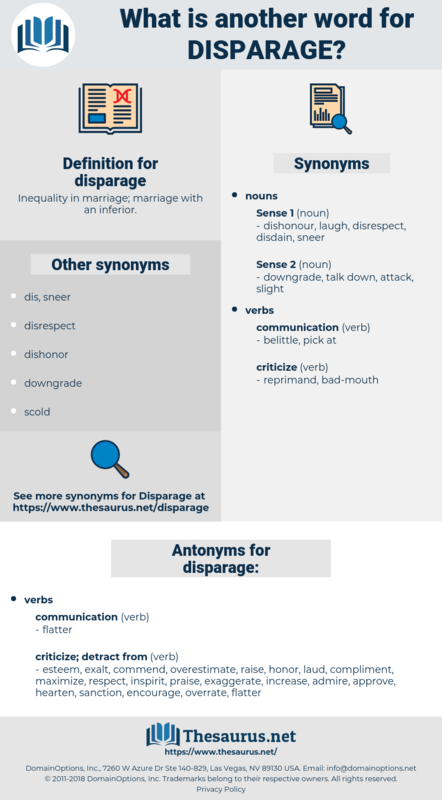 derogate, minimize, discredit, denigrate, deprecate, depreciate, tear apart, Vilipend, disgrace, trash, pan, belittle. criticize, pick apart, criticise, knock.